During that long blogging sabbatical I took there were so many days I missed that warranted special bentos... New Years, Valentine's Day (I had so many fun new heartsy things too!!! 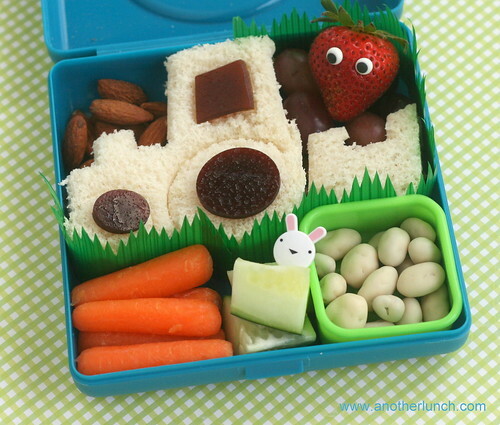 ), April Fool's Day...Easter, Autism Awareness Month... every time one of these occasions passed without a bento to mark the occasion I kicked myself. Well, not literally, but you know what I mean. Well, September is Childhood Cancer Awareness Month. Remember how last year we had that fundraiser for Gabe's My Heart and had the little contest/fundraiser and got 35 ducks adopted for the cause? Wasn't that awesome? Well, guess what. It's September. The last day of September, in fact. And I didn't want another special event to pass me by while I was busy doing something that didn't involve bento blogging about it. 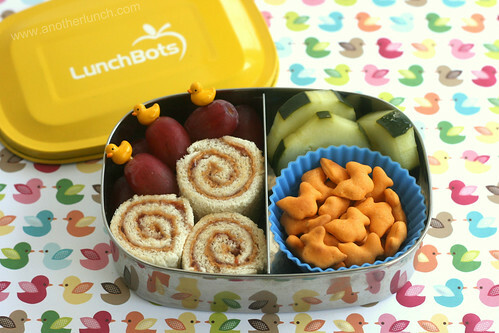 This is a Chemo Duck themed bento packed in a stainless Lunchbots Pico box, the left side holds sandwich-sushi of peanut butter & fruit preserves and purple grapes with duck picks (from allthingsforsale). The right side has duck shaped cheddar crackers (Whole Foods brand) in a silicone cup and some homemade pickles. Quack! Now, *I* myself am not doing any contest or fundraiser on my end for the program this year. But Lu (the founder of the Gabe's My Heart Chemo Duck program) has had a neat one running all month long. For every Chemo Duck you adopt *this month* you get an entry into the prize drawing... and there are some NEAT prizes you guys! Like an iPad 2!!! Now, it's only for this month, and remember how I said it's the last day of the month? Yep, today's the last day to get in on the fun! If you are interested in reading more about Chemo Duck and helping out this lovely cause, you can check out their website and Facebook Page. I fell off the wagon. The bento blogging wagon, that is. I had been plowing right along, then...a trip...a stumble... plop. So, that's me with the strawberry head with crazy green heair and bulging eyes tumbling out of the grape wagon. 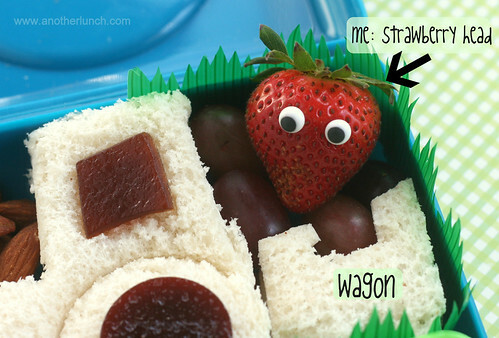 a tractor and wagon sandwich of cream cheese and stawberry preserves on white-wheat bread, fruit leather accents, purple grapes, one kooky strawberry with icing eyes, roasted almonds, baby carrots, cucumber chunks and organic yogurt covered raisins. The tractor and wagon sandwich was made using a Lunch Punch. A very super special Lunch Punch that is a promotion through the Bega cheese company in Australia. If you live down undah you can search for specially packaged Bega cheese packages for one of four unique Lunch Punch designs! Check out The Lunch Punch's Facebook page for more details! The bento box is a cute little Everset sandwich box and the bento picks and silicone cup were purchased from allthingsforsale (check out the linky box over there in the right margin! ).